With the state budget heading towards the red, local Republican and Democrat state legislators have differing opinions on the projected shortfall. “Obviously, I’m really disappointed to see that that’s taking place right now,” state Rep. Len Greene (R-105) said. Last week, the nonpartisan Office of Fiscal Analysis released figures projecting a $144.5 million deficit in the state’s general fund. “It’s the result of unsound fiscal policies by our governor and the majority party in the legislature. They have not only enacted the largest tax increase in Connecticut history but have failed to make any meaningful spending cuts,” state Rep. David Labriola (R-131) said. The projection reflects an estimated $130.7 million increase in expenditures and a $94.7 million reduction in revenue from original budgeted levels, according to the Office of Fiscal Analysis. Both Labriola and Greene said the state needs to make more spending cuts to balance the budget. “I supported a budget that would’ve reduced spending while not raising taxes at all,” Labriola said. Labriola said the government needs to share sacrifices among all three branches. Greene added that Moody’s Investors Service recently downgraded the state’s debt rating, which he said shows that the state’s heading in the wrong direction. 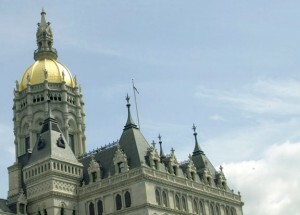 Lay-offs of state workers are off the table since the unions and the governor came to an agreement last year, so cuts will have to come from government agency line items. He said the state has consistently over-spent and over-bonded over the years. “It’s caught up to us,” Greene said. Greene said the state had a chance to address those ongoing issues during last year’s budget session, but instead of making real cuts, the legislature combined agencies without reducing the total budget. He felt the legislature should look back at the budget the House Republicans put forward as a starting point to spending cuts and cuts to social services will be unpopular, but necessary. He said some attempts to cut spending, like an employee’s suggestion box, didn’t come through as planned. “It was a failed attempt in my opinion of trying to take care of the problem,” Greene said. Local Democrat legislators, on the other hand, downplayed the projected shortfall, which is less than 1 percent of the state’s budget for the fiscal year. State Rep. Vickie Nardello (D-89) said that the estimate is only preliminary and that the governor will make the necessary adjustments to bring the budget back in balance. She said small discrepancies such as this are common in state budgets. State Sen. Joesph Crisco (D-17), who represents Naugatuck, Prospect, and Beacon Falls, agreed with Nardello. He echoed Gov. Dannel’s Malloy’s assertion that the actual deficit is closer to $73.6 million and OFA’s estimate doesn’t reflect the $78.6 million in budget cuts Malloy ordered last week. The governor has the power to reduce any line item by 5 percent without seeking legislative approval. Crisco said he anticipates more reductions in the second year of the state budget.